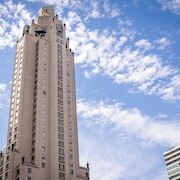 With a stay at Gardens NYC-an Affinia hotel in New York (Upper East Side), you'll be minutes from Bloomingdale's and close to Barney's. This eco-friendly aparthotel is close to Rockefeller Center and Chrysler Building. Make yourself at home in one of the 132 air-conditioned rooms featuring kitchens with full-sized refrigerators/freezers and stovetops. Your room comes with a pillowtop bed. Cable programming provides entertainment, and wired and wireless Internet access is available for a surcharge. Conveniences include phones, as well as laptop-compatible safes and desks. Take advantage of recreation opportunities such as a fitness center, or other amenities including complimentary wireless Internet access and concierge services. This aparthotel also features babysitting/childcare (surcharge), gift shops/newsstands, and a fireplace in the lobby. Grab a bite from a grocery/convenience store, or stay in and take advantage of the aparthotel's room service (during limited hours).